The human brain is a package deal. Most people tend to favor one side over the other, though. 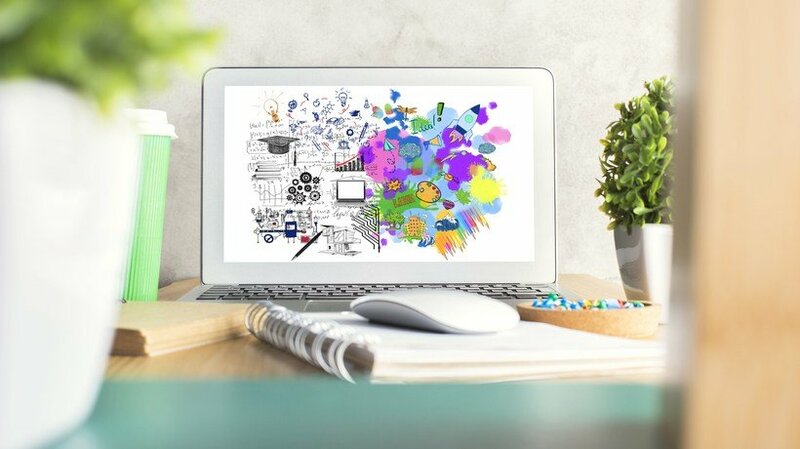 In this article, I'll share 9 tips to engage right-brained online learners in your eLearning course design. Our brains are comprised of two hemispheres that control every aspect of our bodies, from recognizing emotions to regulating our nervous system and heart rate. However, many learners are right-brain dominant. Meaning that they are more creatively-inclined and emotionally-centered. These individuals are also visual by nature, and enjoy sensory experiences. Here are 9 tips to connect with your right-brained online learners and give them the personalized resources they require. Right-brained online learners are often governed by their emotions. At the very least, feelings play a crucial role in their decision-making process. They are also known for being intuitive. Thus, stories with memorable eLearning characters and emotionally-centered plots are a valuable tool. This allows them to link the eLearning experience to favorable feelings, thereby improving knowledge retention and active recall. Anecdotes, case studies, and real-world examples with an emotional twist are ideal options. Music, sound effects, and other audio elements are natural attention-grabbers. They are also particularly useful for right-brained online learners. Background tracks enhance immersion. They also help to create the right mood for your audience, thereby the ideal atmosphere for online learners to ignite their creative spark and emotionally invest in the eLearning course. Just make sure that the music doesn’t overshadow the eLearning content. For example, avoid loud tracks that feature heavy beats or distracting vocals. Another important right-brain trait is the enjoyment of tactile eLearning experiences. Right-brained online learners like to interact with objects and participate in kinesthetic eLearning activities, such as serious games that involve drag-and-drop or point-and-click interactions. They have the opportunity to get involved by activating their imaginations and indulging their senses. Serious games offer right-brained online learners a multisensory eLearning experience, which enhances their ability to absorb the information and retain it for later use. Right-brained online learners enjoy online discussions and debates. They thrive in social settings. Thus, social media platforms are a great addition to your eLearning course design. These tools allow them to interact with their peers and brainstorm ideas. They can also collectively problem-solve in order to achieve a common goal. However, it's wise to set some ground rules to keep the conversation on track, such as posting a weekly prompt or question to focus their efforts. Online learners who favor the left hemisphere prefer information in bullet points. On the other hand, right-brained online learners like to get the complete picture. For example, a summarization of the subject matter instead of an itemized list. As a result, you should provide summaries before and after each eLearning activity so that online learners have a general overview. That said, a bite-sized learning approach is still best, as this gives everyone the opportunity to assimilate the information in smaller doses. For instance, offer a summary of the key takeaways, benefits, and real-world applications of the eLearning course. Then introduce one concept or idea at a time to avoid cognitive overload. Right-brained online learners are visual learners. But they also like to approach problems by exploring patterns and trends. For this reason, it's a good idea to provide visual representations that highlight the facts and stats, and emphasize the similarities between what they've already learned and new concepts. One of the most powerful tools at your disposal is infographics. These learning resources help right-brained individuals see the ideas in action instead, so that they can compare and contrast. Also, remember that left-brained online learners are more mathematically-inclined, while right-brained online learners may need some visual aids to back up the numbers. Another way to appeal to their visual nature is to include online video demos instead of written walkthroughs. Right-brained online learners require a more hands-on approach. For example, invite them to watch a re-enactment of the task to provide an example. Then offer them a simulation so that they can apply the information right away. If necessary, they can refer back to the online video demo to refresh their memory or overcome an obstacle. Additionally, you should conduct performance evaluations to identify gaps, then use the data to create targeted online video demos. Colors convey emotion. In fact, they have the power to set the tone for your entire eLearning course. Especially when you're working with right-brained online learners who are creative and intuitive. Thus, you must choose your color palette carefully and consider its emotional significance. For example, blue can calm your online learners and help them prepare for a stressful eLearning activity, while red may trigger excitement or sense of urgency. Also, avoid using too many colors, as this can create chaos or disorganization in your online learners' minds. The human mind is already wired for visuals. We can absorb information more effectively through images, graphics, and charts. But right-brained online learners are particularly drawn to imagery. Include thought-provoking photos and eLearning character cut-outs to fully engage and inspire them. There are plenty of royalty free photo sites available. Or you can peruse your eLearning authoring tool library to find relevant eLearning resources. A word of warning: avoid using controversial images that distract online learners or alienate certain individuals. Research your audience to determine their backgrounds and experience levels. Then choose images that are appropriate and relatable. The idea of brain dominance is often debated in the field of scientific study. However, even if you don't subscribe to this theory, it's still wise to incorporate a variety of eLearning activities. Doing so gives everyone the opportunity to get the information they need in a format that's easily digestible. Right-brained online learners are guided by emotions. Read the article 5 Tips To Use The Plutchik’s Wheel Of Emotions In eLearning to explore the basic principles of the Plutchik’s Wheel of Emotions and 5 tips on how to use them in your next eLearning course.